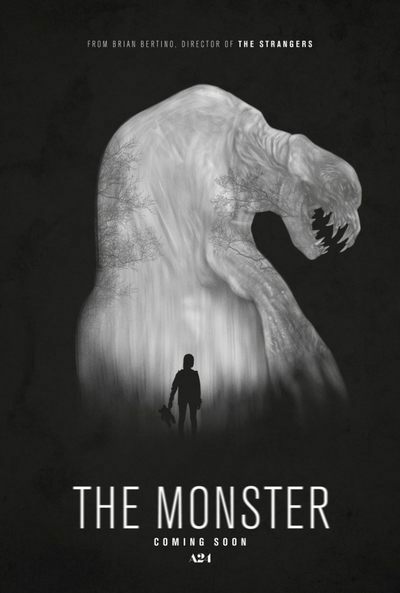 The Monster tells the story about a mother and her young daughter who must confront a terrifying monster when they break down on a deserted road. That's the basic set up for The Monster and it's incredible what an impactful and layered story comes out of that simple premise. The Monster is scary on multiple levels both human and unexplainable in nature. The story hinges on fear of things unknown and known and combines life and death in an emotionally startling way that puts the human condition front and center. All of this with a monster on the lose on a dark and stormy night. The two lead actresses, Zoe Kazan and Ella Ballentine, are nothing short of phenomenal. The relationship between the two is critical to the overall impact of the film and I was blown away by the talent that these two actresses displayed. The result is touching and powerful and the performance of Ella Ballentine as the daughter is a small miracle that deserves recognition. Her performance is as eye opening and star making as Danielle Harris in Halloween 4. Zoe Kazan turns in an absolutely heartbreaking character who both angers us and earns our sympathy as the desperate mother battling alcoholism. The horror genre consistently provides women with strong roles and opportunities to show their skills and it's time the Academy and other award entities pay attention. In addition to the top notch acting, The Monster offers a wonderful script and solid direction to present it with. Woven into the scenes of their struggle to survive the monster are flashbacks showing the troubled relationship between the mother and daughter. Most of the scenes are troubling, some are touching, and all demonstrate the fractured love between the two. You can see that the mother deeply loves her daughter and the daughter is desperate to feel that love from her mother. The alcoholism of the mother is the other monster in this film and it's just as deadly as the beast that is hunting them on that dark and desolate road. The film tells us that monsters are real and they come in many different forms; some come after you in the woods or the dark and others reside within us all and it's up to us to fight them and protect the ones we love. This is beautifully shown as the instinct to fight for survival may be the first time in the mother's life where she cherishes being alive and this realization is passed on to her daughter and there is hope that she can fulfill her own potential in life as well as her mother's lost promise. It really is a beautiful horror story. The Monster is a smart, layered, and emotionally engaging story that should be seen by not only horror fans but fans of film in general. The film has just as much heart as it does scares and contains two of the best performances I've seen all year. The Monster is of those films that proves the horror genre should be taken seriously and deserves more recognition for what it can accomplish. Sounds like a film I MUST SEE!